The classroom gets very quiet. I look up to a roomful of aghast thirteen-year-old faces. I’m not sure which part of my comment is more shocking – the implication of an affair or of smoking – so I rush to clarify. When I first befriended Kurt and Jonelle several years ago, I came away with a sense of admiration. They had a poker room filled with neon signs, two ancient outhouses in the backyard, and a smoker that Kurt had repurposed from an old refrigerator. He is a born tinkerer. I’ve since come to recognize his abiding passion for neon and for smoking. Kurt often supplies wings, ribs, chicken, or pulled pork for social gatherings. As a neighbor, I am frequently assailed by the mouthwatering aromas of his practice pit runs, wafting on the eastern wind towards my front door. Jonelle and I pull into the Sam’s Club parking lot at 4 o’clock. 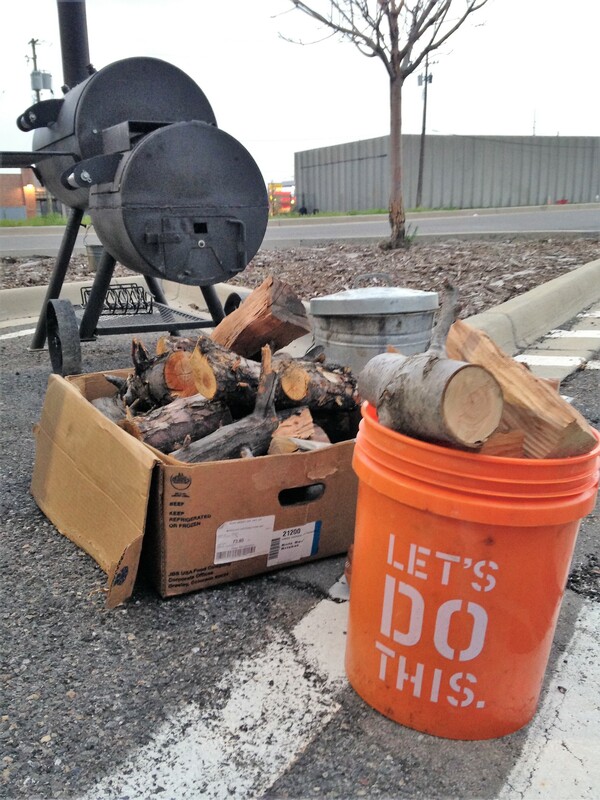 Kurt’s crew arrived earlier and has set up the trailer, smokers, and wood in the southeast corner of the lot. They attend the chefs’ pre-competition meeting. 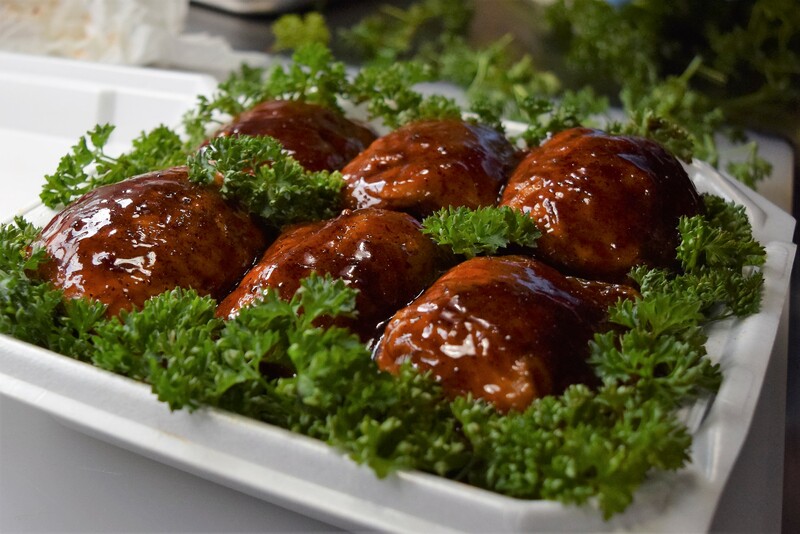 This competition is one of many Kansas City Barbeque Society (KCBS) regional events in its 2017 National Pro Barbeque Tour. 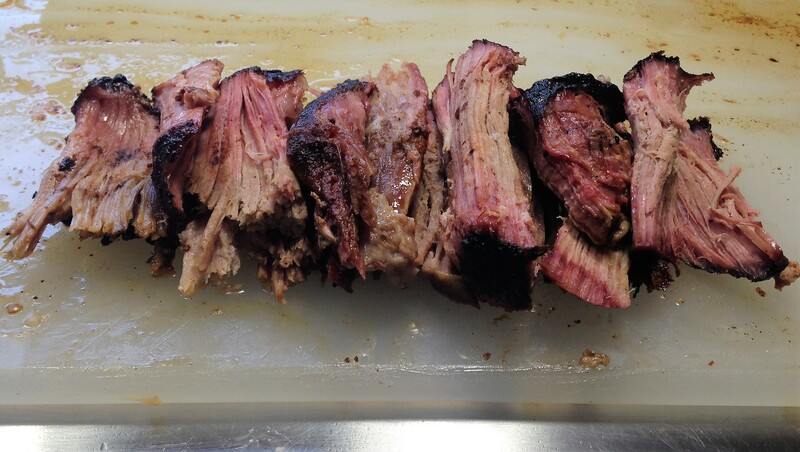 Kansas City comprises one of many styles of smoking meat (other styles include Texas, Memphis, and North and South Carolina). KC-style is meat-centric, owing to its historical meat-packing roots. (Click here for a style breakdown.) Each style has devotees who swear that their style is superior. In addition to the wittiest name on the competition roster, Sorry Charlotte has heart and is a labor of love among its members. Any casual observer watching the team analyze their efforts can see their sharp focus. They huddle closely and confer in quiet tones, tasting as they go: “We did that last time,” says Kurt of the pork. “I think it’s good.” Kevin nods in agreement. As the story goes: that’s some pig. 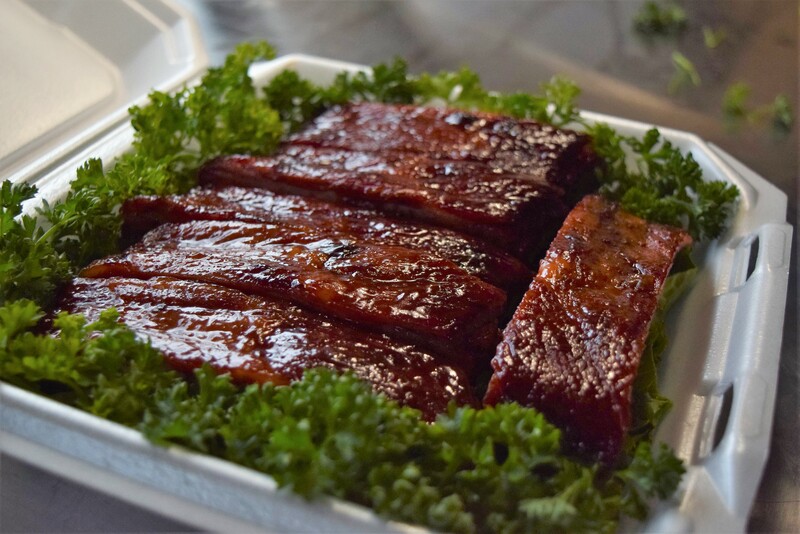 The team will compete in all four categories: chicken, ribs, pork, and brisket, which is the most difficult to perfect. “It’s a tough hunk of meat,” says Kurt, holding up a piece of his own brisket, which is charred all around and ringed with thick pink smoke. 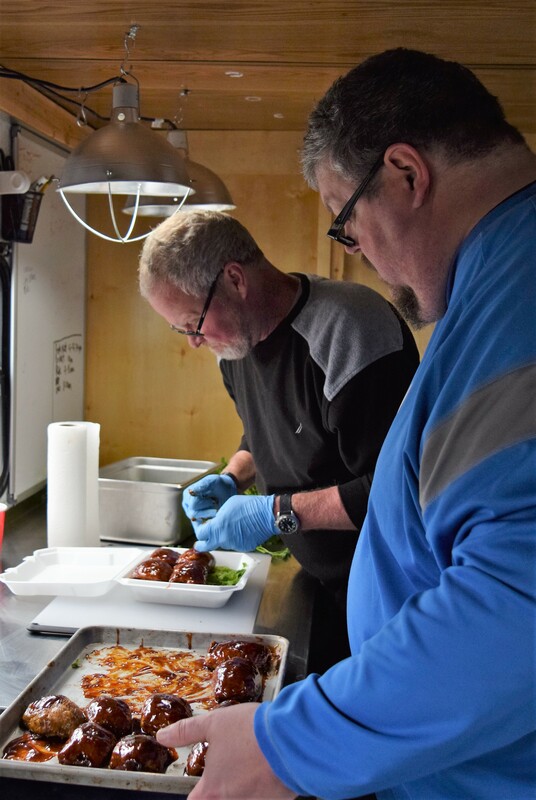 “You’re trying to get it tender and easy to pull apart.” Challenge notwithstanding, the team seems pleased with their burnt ends. Sorry Charlotte wants to do well, of course, but they also want to make scrumptious barbeque. 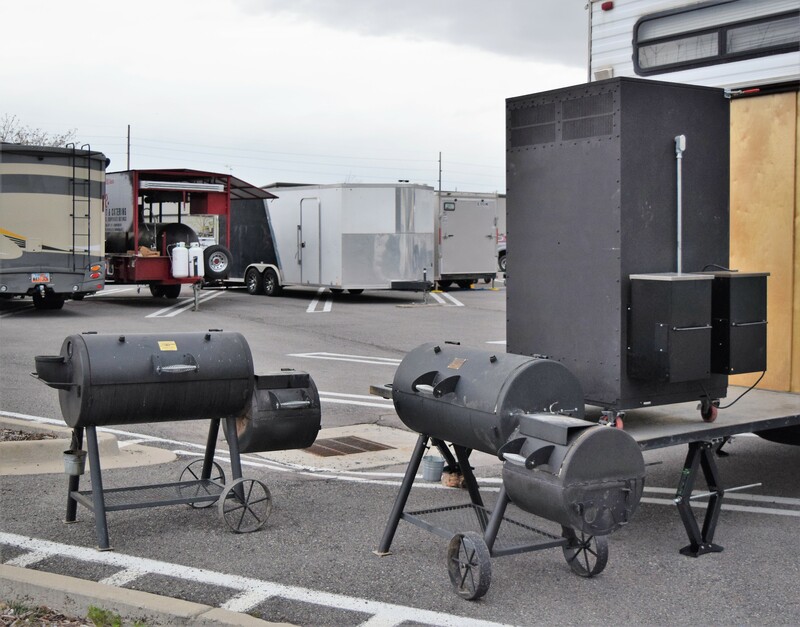 Though this is my first time meeting some of the team, who warmly welcome me to share the close quarters of the trailer, I am equally impressed by their own respective fervors for the art of smoking delicious meat. This is Kurt, not crying. Heavy storm winds blew through the area in every conflicting direction the night before. The dismal forecast announced snow and rain, overnight and well into the morning. We discover that weather conditions have brought the smokers’ temperature down. Kurt, in characteristic good nature, announces that the temperature’s “not ideal.” A quick brainstorm introduces the idea of setting up a canopy over the smokers. Temperatures recover within minutes. Kevin does a dance when Brad’s phone chimes. When Kevin isn’t dancing, he’s smokin’ in the kitchen. 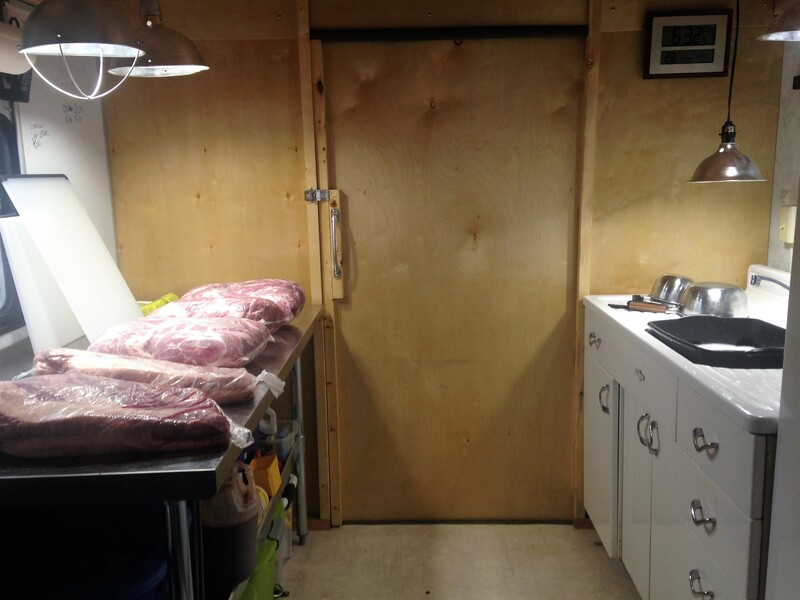 The group is cheerful inside the trailer, which has been retrofitted with a full prep table and second work sink. Space in the trailer is spare, so every clean counter is prime real estate, and, though Jonelle demures about being part of the team, she and Kevin’s wife, Mary, both work steadily behind the scenes to make sauces, clear spaces, and put away tools and ingredients to maximize the group’s efficiency, as do Luke and Brad. They think and operate as a true team. 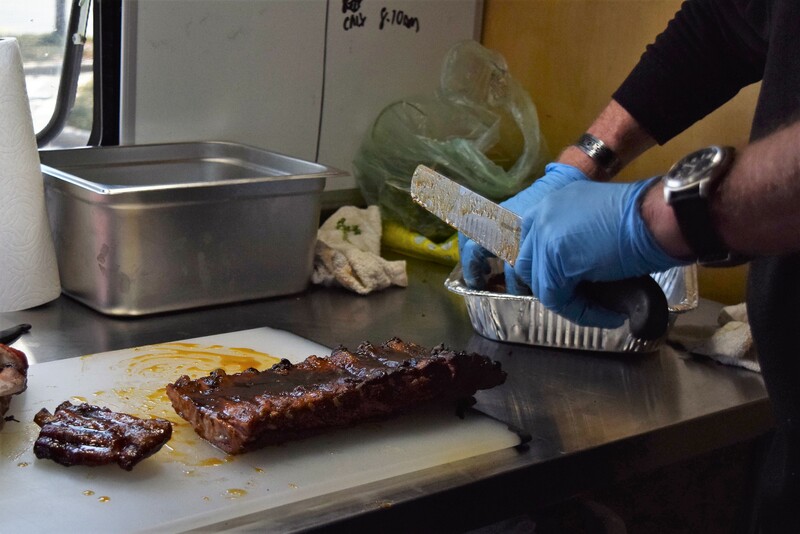 Mid-morning, Kurt dresses the ribs on both sides with an inch-thick layer of brown sugar, margarine, honey, and onion powder, before wrapping the ribs in foil and returning them to finish off. Activity in the trailer increases proportionally to the proximity of noon, when judging begins. The team dips and sauces the chicken, analyzing the texture of the skin, which has been a challenge for them. (Recently, they’ve experimented with leaving half of the skins on and half off, and also with meat glue, to varying degrees of success.) Kevin’s prepped the meat boxes with beds of green leaf and romaine lettuce, on which the meats will rest, and the parsley that will garnish the finished entries. Appearance is an easy category in which to score, but even contest judges eat with their eyes first, so the team is careful to present their hard work in an appealing manner. Kevin and Brad set up the chicken box. These are Sorry Charlotte’s tensest moments – the half hour increments in which they cut the finished meat, analyze it for the choicest, most attractive bits, and arrange it in competition-approved clamshells to deliver to the judges. Brad and Kevin painstakingly adorn each completed dish with parsley, their eyes intent on the clock. Finished products must arrive to the judges on the minute. Even a second’s delay results in being disqualified, or DQ’d. Once they’ve wiped the meat boxes clean of stray sauce, they secure the lids and walk the meat to the judges’ table. 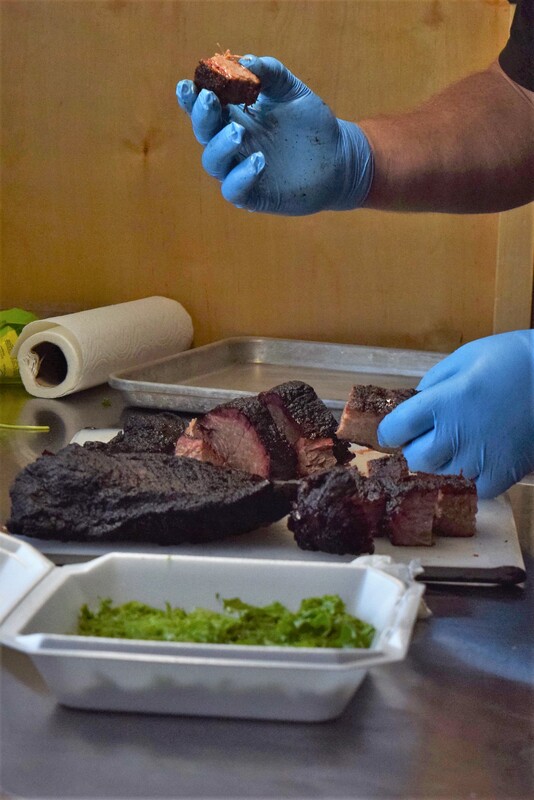 Their pace is stealthy and deliberate through 1:30 p.m., when they deliver their final dish – the brisket – and begin the process of cleaning up. The mood in the trailer snaps quickly back to joking and laughter. 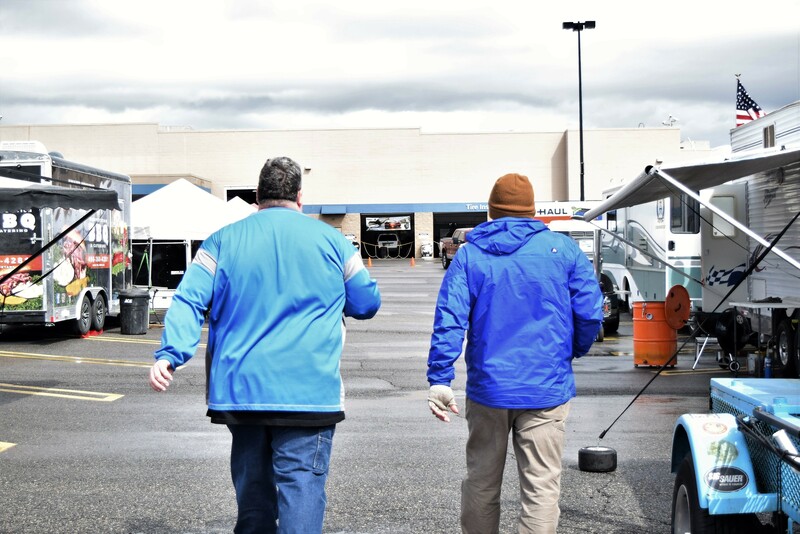 Brad and Luke walk the meat to the judges. Whether it’s the weather, the presence of a newbie interloper, or just bad luck, Sorry Charlotte doesn’t place as highly as they would like in the competition. Kurt and Jonelle return home late Saturday afternoon, a little sad, but with their thoughts on the next competition. “If you know Kurt,” says Jonelle, smiling mischievously, “by tomorrow, he’ll have a whole new game plan ready to go.” This, I think, is the biggest lesson about competitive barbeque: its participants are fierce, inspired, and unlikely to give up in the face of defeat or unremitting wind and rain. Determination and stamina hold them aloft through a long night of keeping the fires lit. They give the effort their very best. 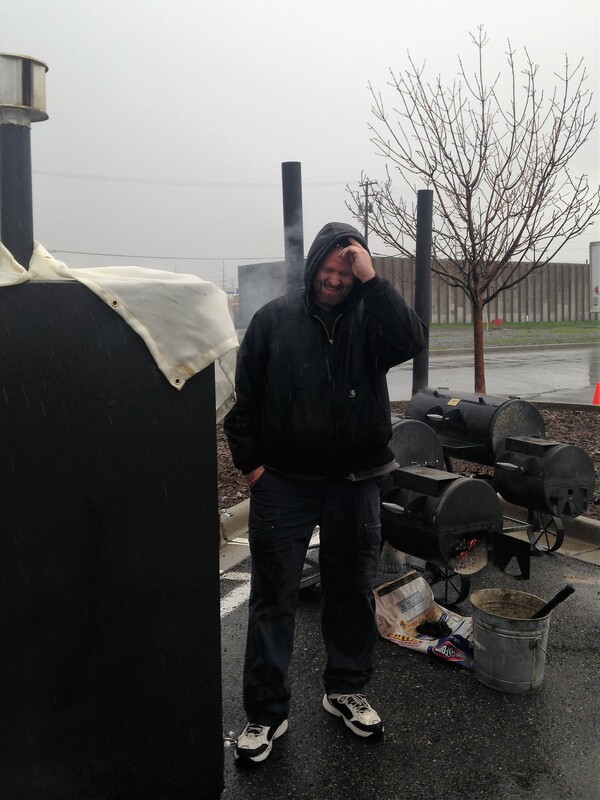 They understand, as Kurt aptly pointed out, there’s no crying in barbeque. Many thanks to the Sorry Charlotte team for inspiring and fun insights into the world of competitive BBQ! * Fellow spelling sticklers, take note: Meat heated by fire is commonly spelled ‘barbecue’ with a ‘c’. In this essay, I will be using a ‘q’, because the abbreviation is BBQ, not BBC.